Having been to the brewery quite a few times on business, my inquiries into the history of the statue led me here. I don't know if I'd place as much importance on it, as the manufacturer, M Gebelt & Bros., was sued for "unauthorized duplication of objects" in 1876 by J.W. Fiske & Company. This is in the same text you cited (Zinc Sculpture in America, 1850-1950). I was told that the statue was valued at roughly $50,000 and that there were maybe 40 of them made. Since it was a knock-off of the Fiske, I think it might be simply worth its weight in zinc, which at current market prices, is roughly $1 per pound. Historical value might add a bit, but I think shipping the statue back to Albany might cost more than what it is actually worth. Says the guy not from Albany. Given that Beverwyck no longer stands, and the brand itself was absorbed by Pabst, and Gambrinus was part of the property legally acquired by F&M Schaefer, how could the return of the statue be justified, given that it is a rightful part of the brewery property in Breinigsville? Also, where would the statue be placed in Albany? Certainly not back on North Ferry Street in the middle of a shabby industrial area. Who would would even care? I ask, because who besides you and I have even given as much thought to this cast forgery? I write about beer, beer culture and history—specifically the history of beer and brewing in the upper Hudson Valley. This post, albeit a bit tongue and cheek, isn’t really about bringing a statue back to Albany—or for that matter the statue at all. What I had hoped it would do is contextualize a bit of that history. 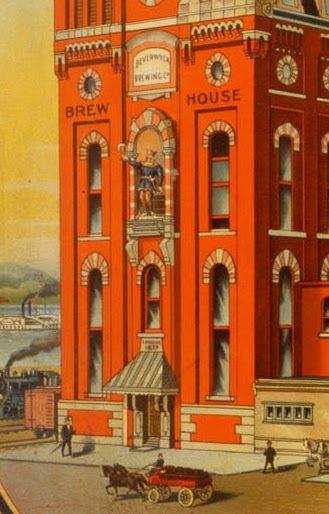 The call to action motif of "bring back the statute", allowed me to introduce the concept of Gambrinus; it shows that Beverwyck was striving to be a competitive brewery—or at least look like one; I can reinforce the general history—explaining the purchase of Beverwyck by Schafer in 1950. Hell, I can even touch upon the idea of the late 19th century trend of polychroming architectural elements on buildings. I'm trying to explain history, not just repeat facts. But I had another motive. If you’d read any of my other stuff about the history of upper Hudson Valley brewing and Albany Ale, you’d know that this area (and the country for that matter) has history of ale brewing—a three hundred year history—which has all but been forgotten. Wiped away from the collective conscience through apathy and misrepresentation. 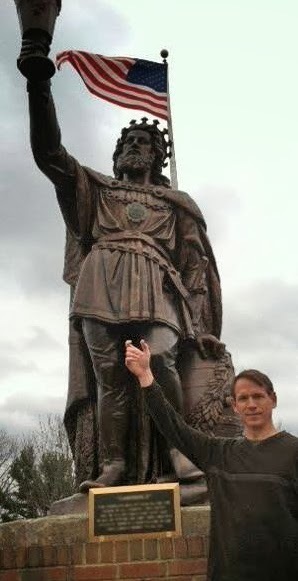 So, one might say that the Gambrinus statute, and how it ended up leaving Albany, might be a pretty good metaphor for that history. As to if the statue should ever return to Albany—and I don’t think it ever will. I actually think the area around Broadway and N. Ferry would be pretty appropriate. While Beverwyck once stood near there, so did Quinn & Nolan Brewing Company, Andrew Kirk’s Brewery (later Fort Orange Brewing Company), as well as the first microbrewery east of the Rocky Mountains—the William S. Newman Brewing Company. All were only a hundred or so yards from each other. Aside from that, the area—dubbed the Warehouse District—is one of the fastest growing bar and restaurant locales in the city. A number of beer-centric bars and restaurants have opened, including Wolff’s Biergarten, the Barrel Saloon, and Stout. Nine Pin Cidery operates in that area and plans for a craft beer bar and micro brewery are in the works. Well, given your conclusive statement - "I WANT ALBANY'S KING BACK WHERE HE BELONGS!" - I assumed that you really wanted the statue back, so I guess I wasn't reading deeply enough into your blog post, not having read anything else you have previously posted. I suppose it is up to the little guys of the Hudson Valley to team up to bring the area history back into the spotlight as part of early American brewing, and you have done a fine job just by helping me to connect a couple dots in brewery history as it relates to this particular statue. I believe that a central part of bringing local brewing history back to an area is the agricultural side of the story. Simply having small local breweries is not the whole story, because with the ability to have hops and grains delivered from any corner of the globe, the true regional characteristics are lost. Growing the grains and hops and other items used for flavor in that particular region would truly restore the brewing culture. It's like people who grow champagne grapes elsewhere in the world and make wine. It's not truly champagne because it was not made in Champagne. The same would go for the Hudson Valley. It would be nice to see Pabst (or whoever might own Beverwyck's recipes now, given the massive mergers afoot in today's headlines) restore production of regional brews and let consumers decide what is worth preserving. To clarify, the Gebelt statues were not "knock offs" as Jack implied. Gebelt, J.A. Stoll, and M.J. Seelig were all Brooklyn foundries that had agreements with J.W. Fiske. These companies were provided Fiske's molds and were not to use them without authorization. Fiske brought suit against Gebelt for unauthorized use of one of its molds. The results of the lawsuit have never been discovered and there's no evidence that the alleged unauthorized use involved Fiske's Gambrinus mold. (Gambrinus wasn't the only type of statue that Gebelt cast for Fiske.) I would suggest that the dispute was resolved amicably, as Fiske and Gebelt continued doing business together after the lawsuit. I own one of the Gambrinus statues created by Gebelt. My statue was created in 1882, more than 5 years after the date the lawsuit was filed. I would be nice if an Albany museum could purchase the Boston Beer Company statue and move it back to the city where it belongs. Better still, provide a permanent indoor location for the statue where it can be placed on public display. I'd love the city to build a roundabout at the intersection of N. Ferry and Broadway and place the statue there. But knowing Albany, they won't. I tried to stop and see the statue on a trip south this summer. No luck. Wouldn't let us past the guard booth the entrance. That brewery is locked down tighter than Fort Knox. They acted like they were hiding alien bodies rather than making beer. I would also like to see this Gambrinus,because my great grandfather was Terence Quinn.He was brother in law and partnered with Michael Nolan in "Quinn and Nolan Ale Brewing Co." and "Beverwyck Brewing". I plan on attending Hudson Valley Hops in May and am trying to arrange a trip to see it.